The Alpha Trader Forum, a summit for buy-side traders, held its largest ever meeting yesterday, with regulatory intervention identified as the biggest challenge facing trading desks. The Alpha Trader Forum (ATF), a summit for buy-side traders, held its largest ever meeting yesterday, with regulatory intervention identified as the biggest challenge facing trading desks. The ATF meeting was hosted at the London Stock Exchange after a market opening ceremony and fostered discussions between almost 60 buy-side trading heads from across Europe. During a session that was open to the buy-side-only, 36.8% identified regulatory intervention as the most substantial internal challenge, followed by the pressure to keep performing (26.3%) and a lack of investment and resources at brokers. A number of new regulations that will impact how the buy-side trades equities are expected to progress significantly this year. These include MiFID II - which will include new rules governing high-frequency trading, off-exchange trading and post-trade data - and a financial transaction tax on equity and derivatives trades in some European countries. During the buy-side-only session, finding liquidity was voted as the biggest concern this year by 23.6%, ahead of the need to keep abreast of the latest regulation (14.5%) and achieving best execution (10.9%). 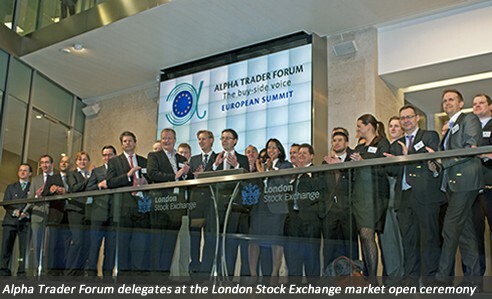 "The inaugural Alpha Trader Forum EU Summit yesterday was a great success. We were honoured to be asked to perform the market open ceremony at the London Stock Exchange and delighted that we had 57 senior buy-side members from institutional investment houses across the UK and continental Europe in attendance," said Anita Karppi, managing director, ATF. "The day was full of interactive roundtable debates and private closed door sessions, all discussing key and pertinent buy-side issues and concerns which is the objective of the Alpha Trader Forum." The ATF will continue to host buy-side led events this year, with summits planned in the Nordics, France and London in the first half of this year.